So, which one should you choose? Below, we provide an in-depth overview of each of these lace materials. In each review, we highlight the key features of each fabric and share what we like about them, as well as what other sewers who have used each material have had to say about working with them. After you read through the reviews and decide on an option that you would like to buy, click on the yellow link to find the best prices currently available at Fabric.com. 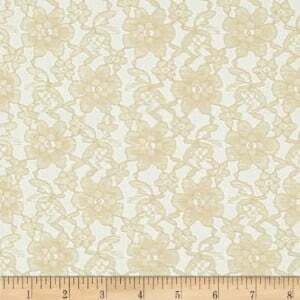 First up on our list of the best lace material is this option from Raschelle Lace Champagne Fabric. It has a truly exquisite floral design that is timeless and would work perfectly for any project you are planning on making. The material is delicate and it has a slight sheen, which adds to the beauty of the material. 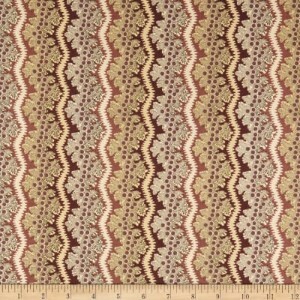 The super light weight of this lace fabric makes it suitable for a wide variety of applications; particularly apparel. Use it as an overlay for a satin gown, you can create a lovely piece of lingerie by adding elastic to it, or you could use it as an accent on a delicate hand-stitched chemise made out of knit fabric. You could also turn it into a delicate drapery, as it will allow light to flow through your windows, yet offer a just a bit of privacy. This lace material is made of 100 percent polyester, so even though it’s lightweight and delicate, it’s still pretty durable. It measures 58 inches wide and can be purchased by the yard. There are several colors to choose from, too, including white, royal blue, baby blue, turquoise, coral pink, hunter green, ivory, lavender, fuchsia, orange, and black; among other colors. Care instructions are typical for lace; hand-wash or dry clean. According to the reviews that we read, other shoppers who have used this product are very pleased with it. They loved the design, the construction, and how fast the shipping was. Honestly, we couldn’t find any reasons to complain! 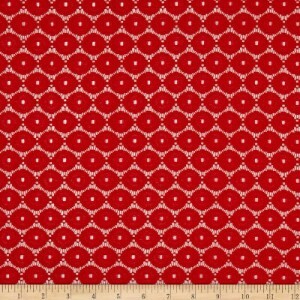 We love this fabric! Final Verdict: If you’re looking for a well-crafted, affordable, and lovely material, you’ll love Raschelle Lace Fabric. It’s just an exquisite material. 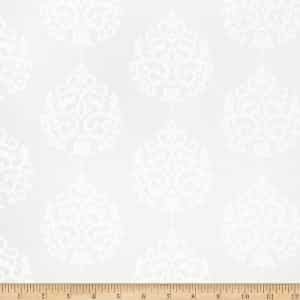 If you are on the hunt for a unique lace fabric, then you simply must check out this Circle Lace Fabric from the Fabric Mart. As the name suggests, it features a circle patter, which offers a very unique look and will surely attract attention. 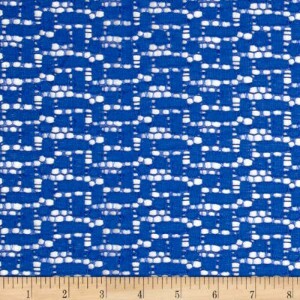 For example, if you’re using a dress form to make a gown out of silk or a shirt out of denim and chambray, this circle lace fabric would make a lovely accent. You could also use some fabric ribbons and turn it into a stunning table runner. The design alone is enough to make this material stand out, but the red color makes it even more stunning. Made of 100 percent polyester, this fabric is delicate, yet durable, and it’s lightweight. It measures 58 inches wide and can be purchased by the yard. Another reason to love this fabric is the care instructions: it can be machine washed! Just make sure you lay it flat to dry. According to the reviews that we have read, customers who have used this lace said that they were very pleased with the design, the construction, and how easy it is to work with. Final Verdict: For a truly unique lace fabric, Fabric Mart Circle Lace is an excellent choice. The circle design is unexpected and the red color makes a bold statement. Here’s another incredible lace fabric that will definitely make a wonderful statement, no matter what you are planning on turning it into! This Crochet Lace Fabric from Mike Cannety Textiles is simply exquisite. The crochet design features a combination of open and closed weave to make a truly stunning pattern. And, as if the design wasn’t beautiful enough, the royal blue color makes it even more incredible! Honestly, you’ll be hard-pressed to find another lace fabric that is as unique as this one! You could make this fabric into a beautiful shawl for a formal affair, or you could use it as an overlay for a skirt made out of flannel to give it some pizzazz. Whatever you plan on doing with this material, you’ll love how easy it is to work with. You can easily pass hand sewing needle through it, or you can pass it through your sewing machine, too. It’s made of 100 percent polyester, it’s 60 inches wide and it’s sold by the yard. In addition to the incredible design, color, and construction, what we really love about this lace material is that it is so easy to care for! That’s because it can be machine washed and tumbled dry! Talk about easy care! Again, we couldn’t find any reasons to complain this lace material. Next up on our list of the best lace fabrics is the Lace Plum Fabric from Andover Windermere. This material would be perfect to turn into a quilt! Just combine it with quilting fabric or pre-cut quilt squares and you can turn it into a truly stunning quilt that would look perfect as a bedspread or as a throw on a sofa or chair. Of course, you could also use it to make apparel or other home accents, like a table cloth window coverings. The design is a unique delicate floral pattern that is laid out in vertical columns. It features an array of colors, including deep purple, mauve, and beige. Made of 100 percent cotton, this lace material is delicate, yet durable and very soft. It measures 44 inches wide and can be purchased by the yard and the half yard. It’s also very easy to care for, as it can be machine washed and tumbled dry. We found that this fabric was incredibly easy to work with, too. Final Verdict: The Andover and Makeover Windermere Lace Fabric is just lovely. It’s made of 100 percent cotton, so it’s very soft to the touch, and it can be used in so many different projects. The last material featured on our list of the best lace fabrics is this option from Fabricut Inc. It’s an ivory color that features a lovely medallion print that almost looks like a modified fleur de lis, which is just breathtaking and delicate. We could totally picture this fabric making as beautiful overlay or train for a wedding gown made out of taffeta or even velvet! Of course, you could use it to make anything you would like; a delicate accent with upholstery fabric or a touch that would make a jacket or shirt made out of wool and cashmere look even more luxurious. The material is made of 100 percent polyester and it measures 56 inches wide and is sold by the yard and half yard. It has an 11 inch vertical repeat. The weight is very light and it’s made in Turkey. It does need to be dry cleaned, so do keep that in mind before ordering, as it may affect your application. Final Verdict: If you are looking to make a stunning statement piece for your home décor or you want to add some interest to any piece of apparel, this lace fabric from Fabricut Inc will surely meet your needs. The design is stunning and it is very well constructed. Whether you are a novice sewer who is just learning the ropes with the assistance of a sewing help guide, or you are a professional seamstress that has been sewing for years, there are some basic sewing essentials that you are going to need to have on-hand. Sewing patterns, needles, thread, a comfortable sewing chair and a sewing desk are just some of the supplies that any seamstress should have. Of course, you’re also going to want to have a nice assortment of materials to work with, too. Of all the different materials that are out there, lace is definitely one of the fabrics that you are going to want to try working with at some point or another. It is just such a timeless material that can be used in so many different ways. Whatever you use it to make, you can be sure that your piece will be beautiful; however, you do need to ensure that you are using the best lace fabric possible. What exactly is lace? What can you make with lace? What factors should you take into consideration when you are purchasing lace? Below, you’ll find the answers to all of these questions so that you can find the best lace fabric to suit your needs. Lace has been around for centuries; in fact, it dates back as far as the 15th century. Initially, it was made out of silk, gold, silver, and silk, which were hand woven to create a lovely pattern. But as the popularity of the material took off and the techniques advanced, other materials were used to create lace, and the process of making the material changed, too. Now, it is often made with machines and it is commonly made from cotton, polyester, or rayon. However, you can still find higher-end, hand-woven lace; but do note that it is going to cost you more to get that higher quality material. Plus, lace that is made out of these more luxurious materials and that is hand-woven is much more delicate and does require extra care when washing; usually, it has to be hand washed or it must be dry cleaned. No matter what type of lace you choose, there are so many different designs and patterns available, and all of them feature an open weave with spaces between those weaves, creating a fabric that is semi-transparent. This is the top-of-the-line lace. To make it, the elements of the fabric are outlined with a heavy cording. This material is heavier and it is usually made out of linen or silk, as well as threads that are made of heavy metals. The most common types of guipure lace is Chantilly, which is known for being one of the most intricate and luxurious types of lace material. 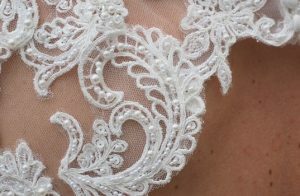 This lace material is embroidered using a very intricate hand-stitching technique that is applied to a mesh material. This is another type of lace that, as the name indicates, features a variety of beads and sequins, which most the material even more eye-catching. This lace was created in the Alenon region of France, and it is often referred to as the Queen of Lace. It is a needle lace, and it features raised cording, which runs throughout the design and the cording is placed under the pattern. These are just some of the different types of lace fabrics that are available. Each one offers a different design and a different construction, so no matter what type of look you are interested in, you can be sure that you will find a lace material that will suit your needs. The style. Of course, you want to consider the style that you would like. As mentioned, lace comes in a variety of different styles and designs, so you want to make sure you choose something that suits your needs. The weight. All lace is pretty lightweight; however, there are some options that are heavier in weight than others. The construction. What is the lace made out of? Lace that’s made out of polyester and cotton tends to be more durable and can often be machine washed, while lace that is made out of linen, satin, or silk is more delicate and usually requires gentler care. Lace is one of the most classic materials around. It has such a timeless look that lends itself to so many different styles. If you are planning on working with lace fabric, you do want to make sure that you are choosing the best option possible so that you can ensure you are making the best quality product.